December Education and Meeting Event on Cape Cod a success! On Saturday, December 1, Rick Horton taught “An Exploration of the Basic Systems That Make Up the Physical Body” to a class of 35 eager students. Using lecture, group discussion and even individual drawing exercises, attendees reviewed anatomy and physiology and sharpened their brains. On Sunday, December 2, Diana Thompson taught an exciting “SOAP Notes and Charting for Massage Therapists” class to 38 massage therapists. Attendees left with tools to chart effectively and with a new enthusiasm for practicing massage! 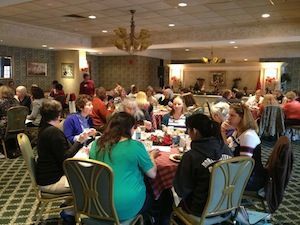 The AMTA-MA Chapter leadership hosted a lunch and chapter meeting with more than 50 attendees on Sunday. Opening the meeting, President Mary White welcomed members and introduced Diana Thompson of the Massage Therapy Foundation, Matthew Olds, Chair of the State Regulatory Board for Massage Therapy and Jennie Pelletier, member of the State Regulatory Board for Massage Therapy, AMTA National Board Member Richard Wedegartner, the AMTA-MA Chapter leaders and other volunteers present. Mary spoke about the Massage Therapy Foundation's event to be held on Boston next year. The International Massage Therapy Research Conference (IMTRC) will be at the Seaport Hotel and World Trade Center April 25-27, 2013. Those interested in volunteering at the event should see information here. Diana Thompson thanked the AMTA-MA Chapter for our continued support of the Massage Therapy Foundation and further encouraged attendance at the IMTRC event. Debbie Baker presented upcoming education events and explained that the AMTA-MA Chapter is moving to electronic hand-outs in the interest of reducing both chapter expenses and paper waste. You can view the education schedule here. Mary discussed the 2013 Annual Meeting and Education Weekend scheduled for May 4-5 in Needham, MA. The schedule is being finalized and will be available on the AMTA-MA Chapter website in early February. Sr. Pat Dowler spoke about awards and the importance of nominating members. We will need nominees for the humanitarian award, specifically. Nomination forms and more information will be available on the AMTA-MA Chapter website by early February. Sr. Pat also announced that on October 24, 2013, AMTA-MA Chapter would be sponsoring another Legislative Awareness day on Beacon Hill. Event information will be available on the AMTA-MA Chapter website early in 2013. Mary informed us that Governor Patrick has acknowledged NMTAW for the last 4-5 years with a proclamation. Rebecca Torns-Barker, the membership director for AMTA-CT Chapter, presented the New England Regional Conference (NERC) report. NERC will be March 14-17, 2013 in Framingham, MA. Registration is now open at the www.amta-nerc.org website and early bird pricing is in effect until January 13, 2013. AMTA-MA Chapter members Greg Hurd and Allissa Haines are among the list of presenters and Tracy Walton will be the Keynote Speaker. Mary spoke about Dianne Polseno and the Dianne Polseno Scholarship Fund. Donation instructions may be found at the AMTA-MA Chapter website here. The scholarship will be awarded at annual meeting. Membership Chair Kelly Dalbec encouraged students to learn more apply for the scholarship at the AMTA-MA Chapter website here. AMTA National Board member Richard Wedegartner discussed the impact of Hurricane Sandy on members in New York and New Jersey. National AMTA website has a place to donate to fund to help MTs affected. Information is available on National’s website here. The AMTA-MA Chapter donated $2,000 to hurricane fund which National will match. It was a great meeting and the leadership is looking forward to the next meeting in February.